When in Melbourne, make a side trip to see The Great Ocean Road in Torquay, approximately 1h 40 min away. Dedicate the 15th (Mon) to wine at some of the top wineries in the area. And it doesn't end there: take in nature's colorful creations at Royal Botanic Gardens, explore the world behind art at National Gallery of Victoria, learn about all things military at Shrine of Remembrance, and admire nature's wide array of creatures at Melbourne Zoo. For other places to visit, more things to do, maps, and tourist information, refer to the Melbourne trip builder tool . Colombo, Sri Lanka to Melbourne is an approximately 13-hour flight. Traveling from Colombo to Melbourne, you'll lose 4 hours due to the time zone difference. In April, Melbourne is colder than Colombo - with highs of 23°C and lows of 11°C. Finish your sightseeing early on the 15th (Mon) to allow enough time to travel to Sydney. Sydney is known for nightlife, trails, beaches, parks, and museums. 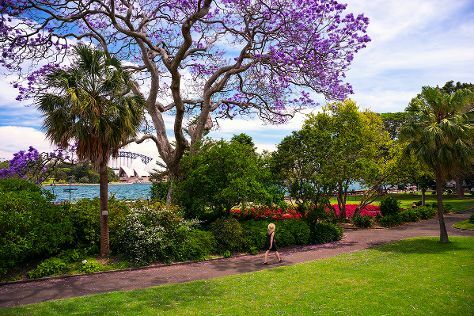 Your plan includes some of its best attractions: take in nature's colorful creations at Royal Botanic Garden Sydney, enjoy the sand and surf at Manly Beach, take in the views from Sydney Harbour Bridge, and admire nature's wide array of creatures at Sea Life Sydney Aquarium. To find ratings, reviews, traveler tips, and tourist information, you can read our Sydney trip planner . Getting from Melbourne to Sydney by flight takes about 3.5 hours. Other options: do a combination of shuttle and flight; or drive. Expect somewhat warmer evenings in Sydney when traveling from Melbourne in April, with lows around 17°C. On the 19th (Fri), you'll have the morning to explore before heading back home.